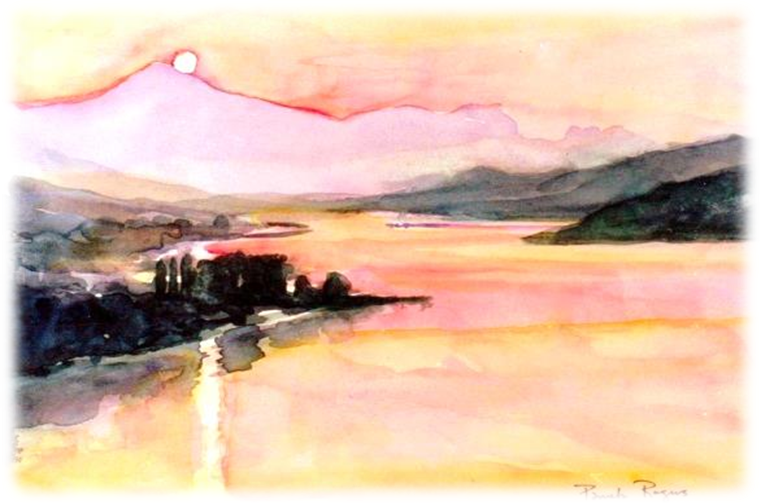 "GREEKSCAPES: Illustrated Journeys with an Artist"
​Born in 1948 in Winston-Salem, North Carolina, Pamela earned her BFA degree in Art from UNC-G in 1970. She taught art and worked in interior design in her husband's home town before meeting the renowned artist who would mentor her for the next seven years. Pamela's life changed drastically with her decision to end her 19-year marriage and seek the way to best continue her painting career. Following her muse led her to an epiphany in an olive grove in Greece, presenting more paths to enlightenment and resulting in a more fulfilling life than even she dared to dream. GREEKSCAPES is a sensitive and personal life story. It's also about the role of art in helping an artist make difficult choices, accept loss, adapt to change, and grow from past sorrows and joys in order to fully embrace the beautiful reality of living in the present. Pamela lives on Poros Island in Greece with her brand new Scottish husband, an acclaimed art historian, and one very spoiled cat. An Interview with Rukia Publishing and the author & Artist Pamela Jane Rogers! Hello Pamela! Thank you so much for joining us today! It is a pleasure to have you with us! Good afternoon, Margaret. This is a perfect time for our interview, because we are having lovely rain showers on the island! The breezes are cool and my wee garden is happy to be watered by Mother Nature. I’ve just finished working on my latest painting for the day. What would you like to know? For me, the best aspect has been the catharsis that comes with focusing on a certain time or place or feeling – the worst? Sitting too long! For better or worse, it’s GREEKSCAPES Journeys with an Aritst – and the Special Edition is GREEKSCAPES Illustrated Journeys with an Artist. How did you conduct your research for book? A friend told me once that I have ‘an elephant brain’. I do have an astute visual memory, but I also reread my diaries for research, and relived the experiences as I wrote. Some of my friends (and my husband) said I seemed very distracted during the years I was writing, and they were glad when I finished. To be fair, the same happens when I’m concentrating on a painting too – my Achilles heel, perhaps? I think most might say my positive attitude, although some find that quality irritating. Yes, I’m interested in readers’ opinions, although I do take my father’s advice and “consider the source” to shield my tender self a bit. My website is http://pamelajanerogers.com and my most up to date information is on https://www.facebook.com/greekscapesjourneys/. I paint, socialize with friends, travel with my husband, help with charities for children and animals, try new vegetarian recipes, and lately I’m enjoying reading about Greece by other authors. It’s a pretty full life on a small island! Greekscapes is my first published book, fueled by my passion for Greece and art. I have started a second, which may turn out to be short stories with a twist– snippets of Greek life that I didn’t include in the memoir. Your words have inspired me. Thank you! I hope to visit Greece and you one day! answer your questions about my work. Yeia mas – in Greek, Good Health to you!